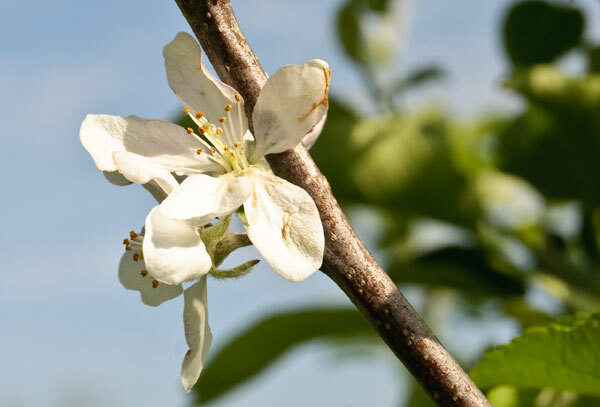 I can’t walk through the orchard without stopping once or twice to check a broken twig, a curled leaf or some other little thing I’ve noticed. I like to catch any problems early and deal with them. Every week or two, just to make sure I’m not missing something important, I stick a pencil and notebook in my pocket, cross the creek, and stroll slowly through the orchard for a more thorough evaluation. 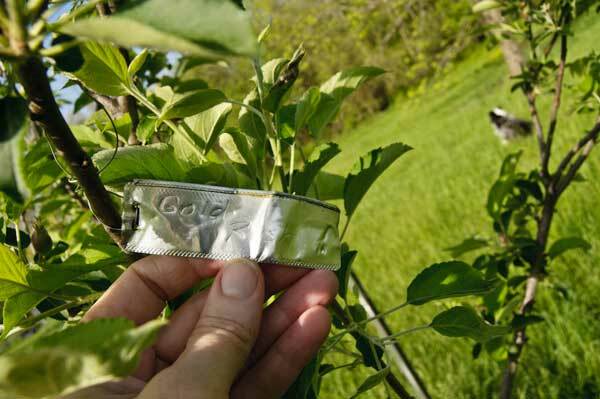 Each tree gets checked, and I make sure I check the metal tag hung on one of the branches so any issues I note are matched to the right tree. Those name tags are important. I’d hate to give credit for this beautiful late blossom to the wrong tree. That could cause hard feelings among the trees . . . if the trees had those kinds of feelings. I like to note which tree sets a generous amount of fruit, and later I’ll note whether that tree dropped most of those early fruits or let them grow into a lot of big juicy apples. Or little juicy apples. Or blah mealy ones. I make a note of any bark damage. This spot actually is deer damage from a previous winter, and it’s healing over better than I’d expected. The water sprouts from below the graft are growing better than I’d expected, too. Pruning time! 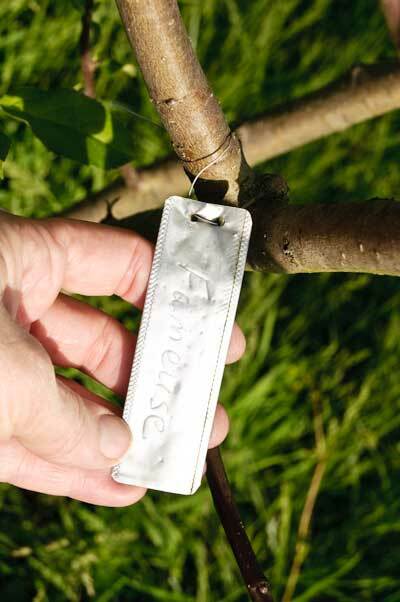 Fameuse is such an interesting name for an apple tree, don’t you think? 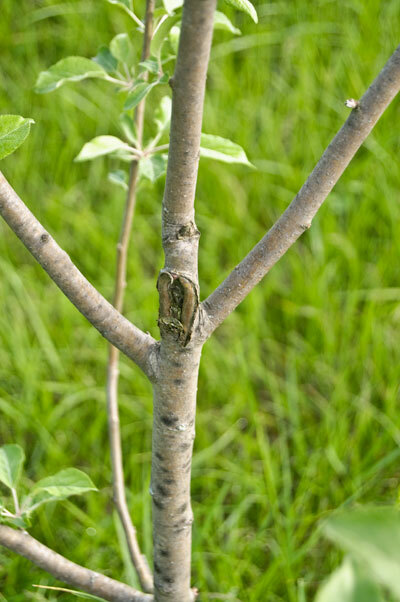 I’d walk around bragging about my Fameuse apple tree if I was sure I was pronouncing it correctly. Nothing spoils a good snooty brag more than mispronouncing the name you’re dropping, though. So I just say ‘oh, that’s one of the heirloom apples, and then wait for people to check the tag. I figure one of these days somebody who actually knows how to pronounce Fameuse, which incidentally originated from France in the 1600s and was imported to the U.S. by way of Canada in the 1700s. 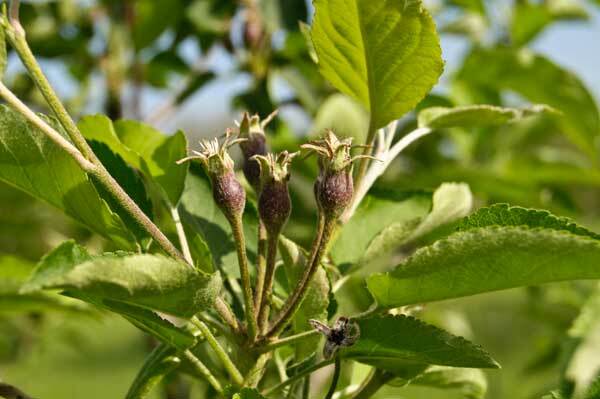 It is, I’m told, an ancestor of the McIntosh apple, which is good enough for me. McIntoshes might be my favorite apple of all time. Or close to it. 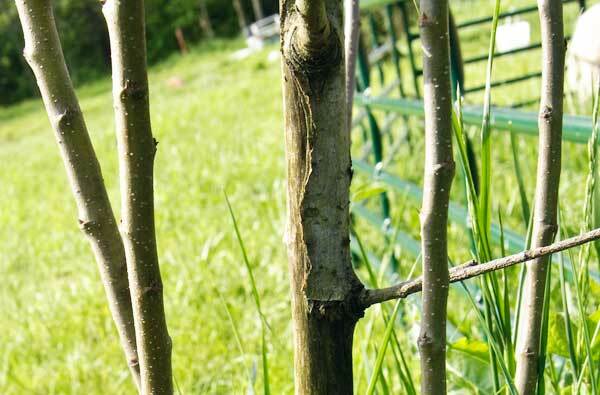 We had a lot of trouble with deer damage in the orchard a couple winters ago. Then one of our dogs had puppies, we kept one, and now we have five dogs. That is, apparently, enough to keep the deer out of the orchard. I’ve heard there are other techniques that don’t necessitate the purchase of large quantities of premium dog food to work effectively. Could this be true? Wouldn’t it have to be a hard wood to have hard feelings?